Using up-to-date technology (this was 1997/8), Apple created a worthy successor to the original Macintosh as a fully integrated computer. No separate monitor, no rat's nest of power cords, and no external drives necessary. The distinguishing feature of these four models is a tray-loading CD-ROM drive. Apple didn't offer any CD-RW or DVD-ROM options. The original iMac was introduced in May 1998 and shipped in August. With a 233 MHz PowerPC 750 (the same G3 CPU used in the beige Power Mac G3), 32 MB of RAM (officially expandable to 256 MB - and possibly to 768 MB using a 512 MB SL2 module plus a low-profile 256 MB SL2 module), a 4 GB hard drive, a 24x CD-ROM, ethernet, stereo speakers, and an integrated 15" multiscan monitor, there wasn't much you'd need to add to the US$1,299 iMac. Beyond recapturing a vision and providing the same usability other Macs do, the iMac broke new ground for an Apple desktop with its Bondi (pronounced bond-I) blue color, two USB (universal serial bus) ports and an infrared port - and no floppy drive, SCSI connector, serial ports, or plugs for ADB devices. Just two months after the iMac first shipped, Apple released the Rev. B iMac, which came with Mac OS 8.5. Video RAM was increased from 2 MB to 6 MB, and the power button could now be used as a reset switch. The Rev. B looks just like the original iMac. With the Rev. 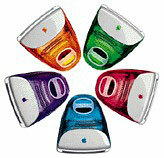 C iMac, Apple moved away from Bondi blue and adopted five fruity colors: tangerine, grape, lime, blueberry, and strawberry. The Janury 1999 model ran at 266 MHz and had a 6 GB hard drive - 50% larger than earlier iMacs. The new iMac sold for US$1,199 and lacked the infrared port found on earlier revisions. The Rev. 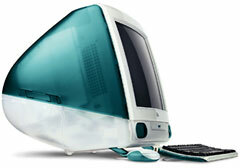 D iMac, introduced in April 1999, had the same color options as the Rev. C, but it had a 333 MHz CPU for 25% more processing power at the same price. The tray-loading iMacs were replaced by slot-loading models in Oct. 1999. These were not only faster, but in many ways they were far superior machines for running Mac OS X. While Apple claims early versions of OS X can run on 128 MB of memory, we strongly recommend you go to at least 256 MB if you plan to run OS X on a tray-loading iMac. Be sure to read and follow Apple's "Read Before You Install" install instructions to increase the likelihood of getting OS X installed and running on the first try. What's the best version of OS X for my Mac?, Ian R Campbell, The Sensible Mac, 2008.02.28. Which version of Mac OS X is best for your hardware depends on several factors. Old Macs in the new economy, John Hatchett, Recycled Computing, 2008.11.25. "We are the kings of making our computers last, last, and last some more." Taking apart a tray-loading iMac, John Hatchett, Recycled Computing, 2008.09.29. There are a few tricks to getting into a tray tray-loading iMac, whether it's to upgrade the computer or strip it for parts. The future of G3 iMacs in the Age of Leopard, Dan Knight, Mac Musings, 2007.09.13. From August 1998 through December 2001, G3 iMacs were Apple's hot consumer computers. Which ones are best for OS X, and which should be avoided? The truth about CRTs and shock danger, Tom Lee, Online Tech Journal, 2007.05.22. You've been warned that CRT voltage can injure and even kill. The truth is that this danger is overstated - and takes attention away from a greater danger. Daystar offers G4 CPU upgrade for 1st-gen iMacs, Peter Cohen, Macworld, 2007.03.29. "Daystar Technology on Thursday announced the XLR8 400 MAChSpeed G4 IMTL Kit. The $99 kit enables you to upgrade your original iMac with a G4-class processor operating at 400 MHz." Is Ubuntu Linux a sensible alternative for Mac users?, Charles Moore, Miscellaneous Ramblings, 2006.09.18. If your Mac can run OS X decently, is there any reason to try Ubuntu Linux? If it can't run OS X well, is Ubuntu a reasonable choice? How Big a Hard Drive Can I Put in My iMac, eMac, Power Mac, PowerBook, or iBook?, Dan Knight, Mac Daniel, 2005.10.24. A lot of older Macs don't know how to deal with drives over 128 GB in size. We look at three options. Can I install the hard drive and CPU from my Power Mac G4 in an iMac?, Dan Knight, Mac Daniel, 2005.02.21. The iMac uses a standard IDE hard drive, but you can't plug in a G4 pulled from a Power Mac. However, there are other CPU upgrade options. MCE slot-loading drive replaces original iMac drive, Mac Minute, 2004.06.14. "MCE Technologies is now offering an internal 24x slot-loading CD-R/RW drive for replacing the tray-loading CD-ROM drive in the original iMac (233, 266, and 333 MHz)." 16x CD-RW for tray loading iMacs, MCE. Burn CD-Rs at 16x, CD-RW at 10x, and read CDs at 24x in oldest iMacs - $199. iMAXpowr G3 and G4, MyMac, 2000.09. In many real-world tests, the G3/466 "felt quicker" than the G4/433 - something LEM has maintained for some time. The dubious economics of processor upgrades, Charles Moore, Miscellaneous Ramblings, 2000.02.07. Even if you can upgrade the CPU, should you? Go to the iMac and eMac index.